The function of a steering system is to steer the vehicle according to driver command inputs to provide overall directional control. 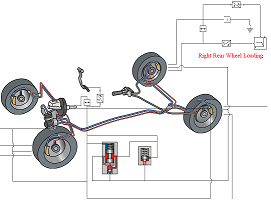 The design of the steering system has a direct influence on the maneuverability of a vehicle. Our example of HyPneu’s power steering system shows the evaluation of the pressure gain and overall steering system performance. The system is powered by a hydraulic pump with a relief valve. The restrictions of the orifices are controlled by the angular difference between the spool and the sleeve of the rotary steering valve. The result of the steering wheel angle and the cylinder displacement is shown. 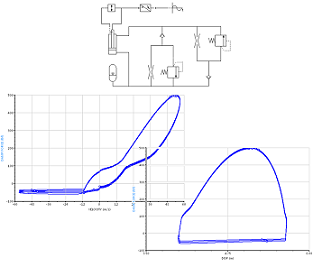 Increasing the wheel oscillation may cause instability of the system. Hydraulic shock absorbers are typically used to effectively control suspension dampening. In structure, a shock absorber is fundamentally a hydraulic device that relies upon various valve designs to control pressure and to dissipate the energy of the suspension that absorbs the shock from the excitation. HyPneu can be used to tune a shock absorber system to provide the desired result. Automotive braking systems have dramatically improved over the past few years, and HyPneu software users will find all models in braking systems. The decreasing design time using HyPneu will also prove to increase safety. Due to the importance of a braking system, it is essential for the newly released product to be reliable. 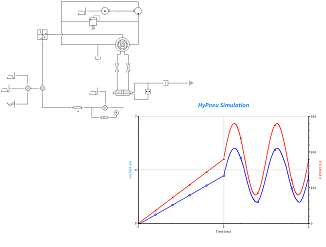 To simulate wear and lock within the system, the designer may also use HyPneu’s Contamination Simulator Add-On.